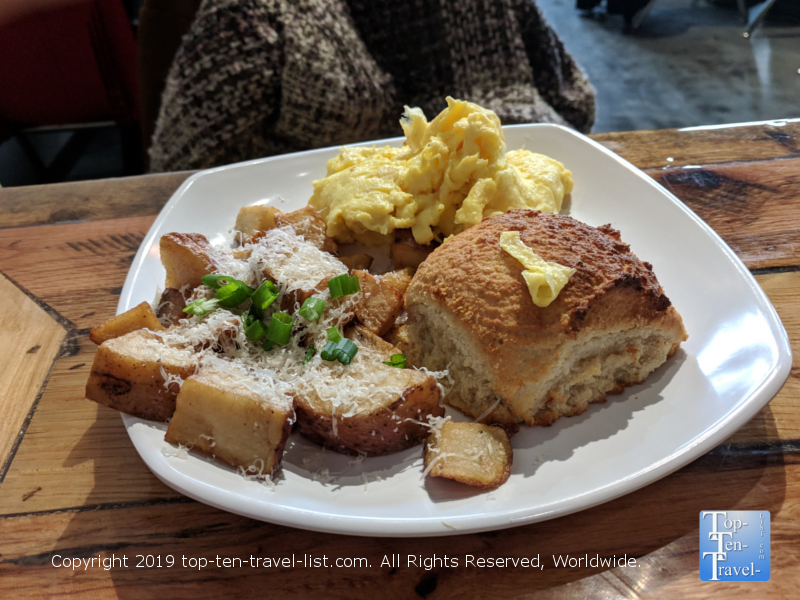 5 Must-Try Breakfast Restaurants in Greenville, SC - Top Ten Travel Blog | Our experiences traveling throughout the US. 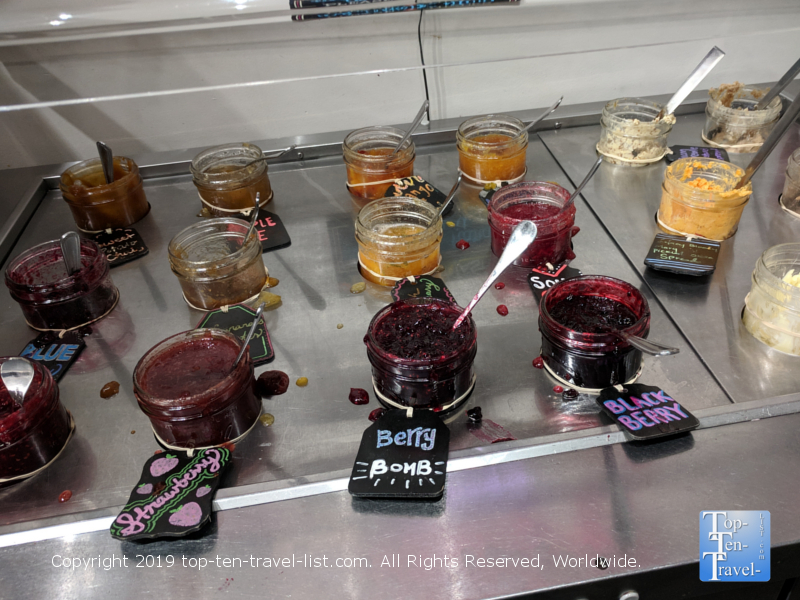 Greenville, an emerging foodie destination in the Upstate South Carolina region, is seeing an upsurge in tourism in recent years. The quaint Main Street, lined with over 100 unique restaurants, draws tourists from all over. Before embarking on your outdoor adventures in the Blue Ridge mountains, fill up at one of these great restaurants! 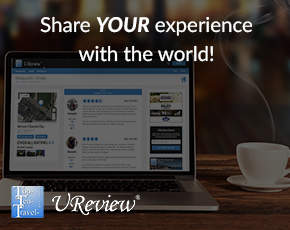 Here are the top 5 breakfast places you will want to check out! 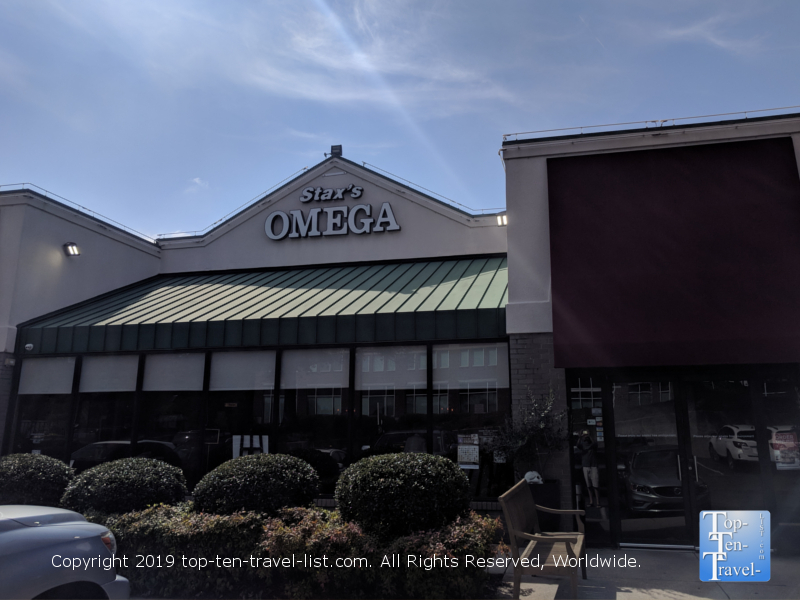 Stax Omega is hands down the best place to treat yourself to a great breakfast in Greenville. 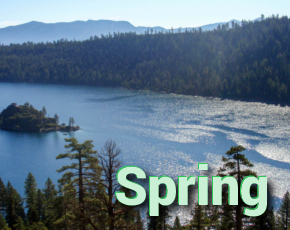 First off, it’s not downtown, so you can skip the hassle of finding parking and maneuvering through big crowds. Second, the menu is huge with choices for the pickiest eaters. Third, the dining room is huge, clean, and attractively decorated. There is also a nice patio for the warmer season. And last but not least, the service is always super friendly. 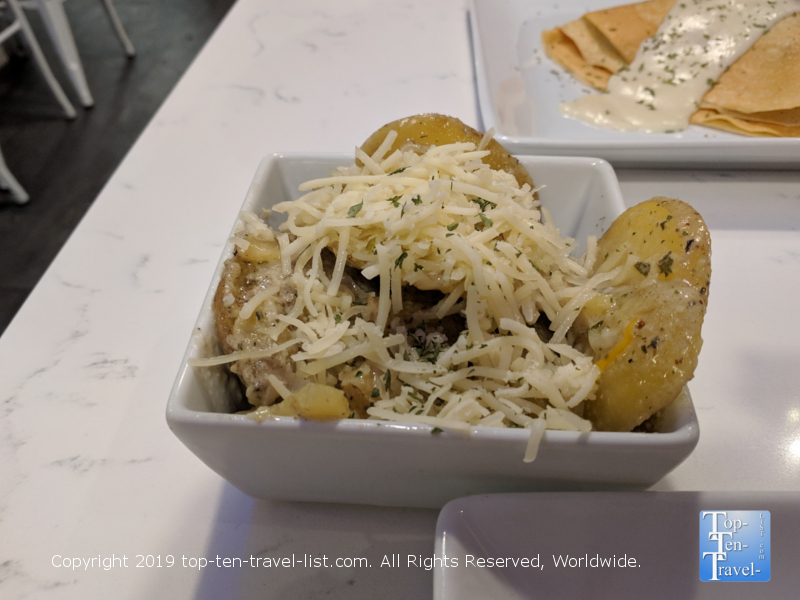 The Stax menu is huge with options for everyone, a rare find in a small city like Greenville. Those needing gluten-free and/or vegetarian fare should be pleased. From savory skillets and omelets, to crepes and waffles, there are abundant choices for everyone here. 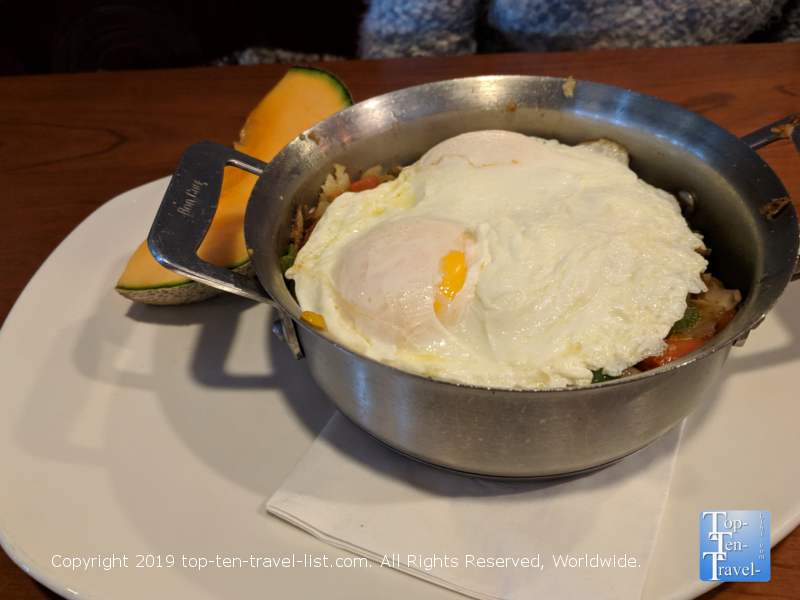 I recommend the Market Skillet, loaded with eggs, veggies, potatoes, and cheese, served with a biscuit/toast -a satisfying and extremely filling dish. Those with a sweet tooth may want to indulge in Ghiradelli Chocolate Chip pancakes or Strawberry French toast. And, rare for a diner, Omega serves excellent coffee, and thus, there is no need to make a separate coffee run. Southern Living rated Stax as one of the best diners in the South. This ward comes at no surprise given the excellent food quality, great ambiance, and top notch service. Sully’s is a unique bagel shop which offers steamed bagels. Instead of ordering a standard bagel with cream cheese, you can try a steamed bagel topped your choice of condiments. When you steam a bagel all of the flavors mesh together nicely for the perfect tasty, albeit extremely messy treat. Sully’s offers a number of creative selections, so you can try something completely different on your next visit. 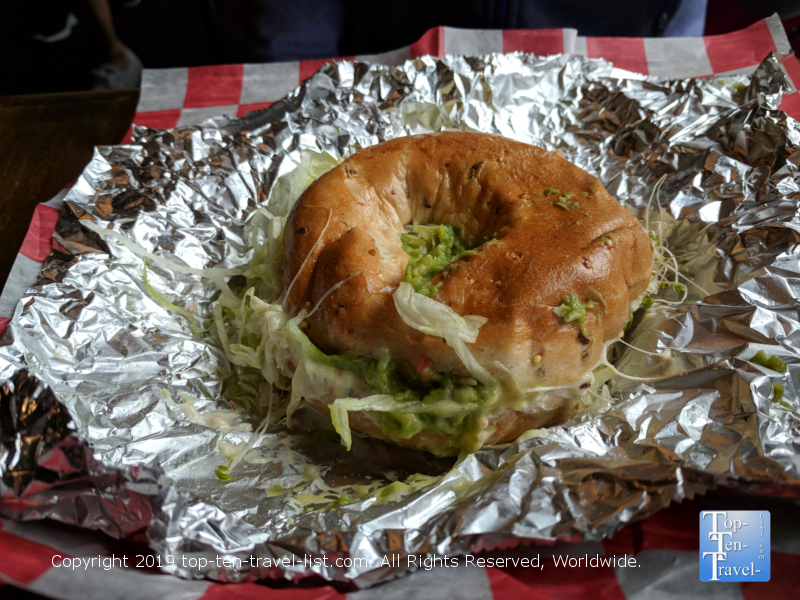 Sully’s offers a wide range of bagels varieties, from breakfast, to meat lover’s, to veggie loaded. They even offer a vegan hummus option. 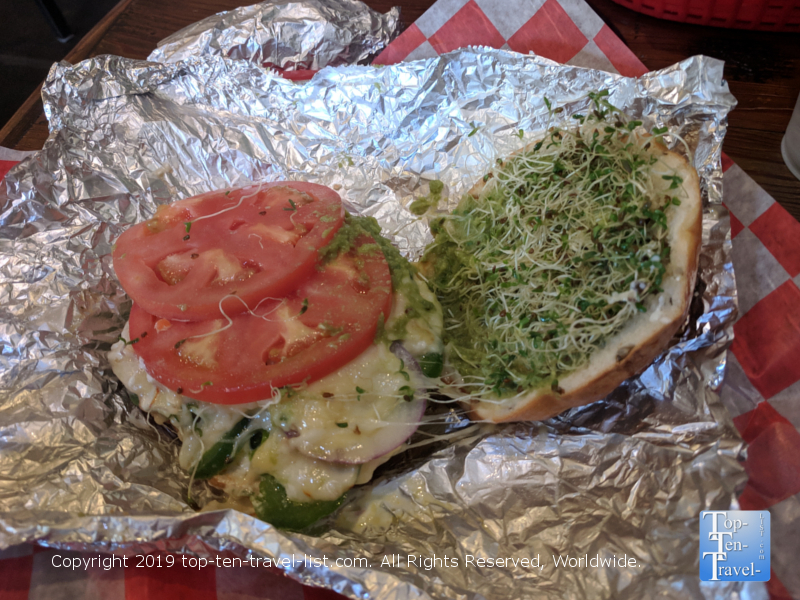 My personal favorite is the Green Vegas (veggie cream cheese, sprouts, avocado, lettuce, & honey mustard). Bagels themselves come in a variety of styles (multi-grain, plain, everything, sesame, cinnamon raisin etc. ), and they even offer a millet/flax gluten-free version for anyone avoiding wheat. Bagels are a bit pricey at 5 to 7 buck a piece, although you are paying for the creativeness. 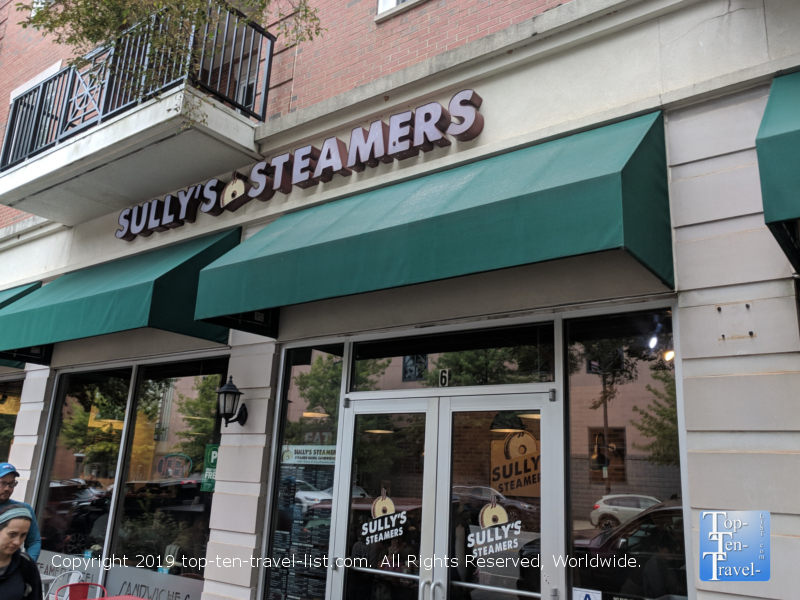 Bonus: Sully’s serves Methodical coffee, the best coffee in town, and one that frequently ranks as the best in the state. Treat yourself to a cup of this wonderful coffee while you are here and save yourself the extra hassle of hitting the drive-thru. If you are in a hurry, Sully’s is a great choice as you can get in and out of here in less than 30 min. 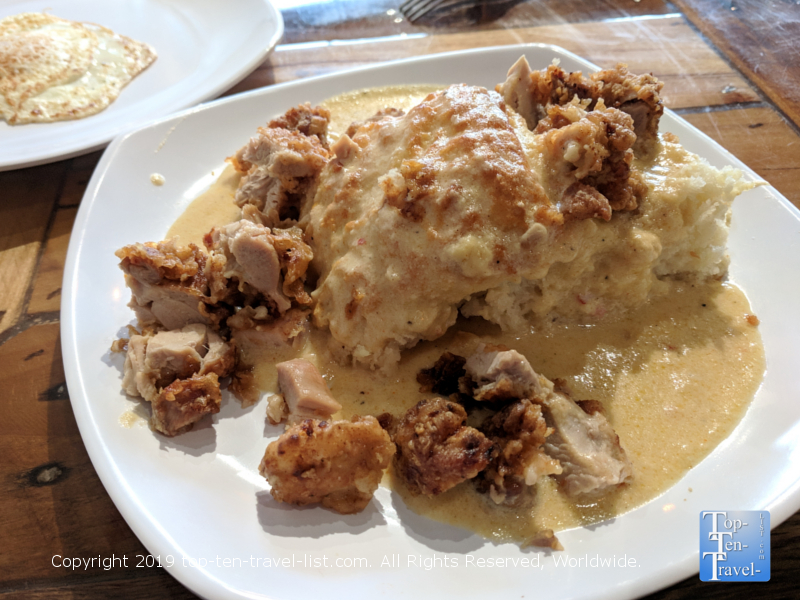 Highlights: super affordable, the most delicious (and biggest) biscuits in town, awesome jam bar with over a dozen creative flavors, a trendy, hip ambiance not found elsewhere in town. Biscuit Head is an extremely popular Southern style breakfast place known for its’ huge biscuits (“as big as a cat’s head” is their odd slogan). 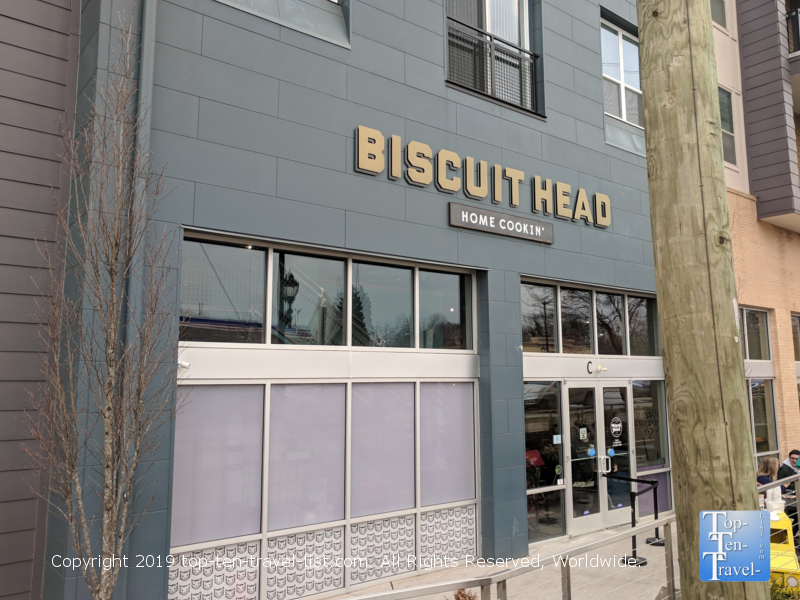 Biscuit Head opened in the foodie haven of Asheville, NC back in 2014. Later, they opened a second location in Greenville, another emerging foodie city. The humongous biscuits can be paired with a gravy flight (choose amongst several creative options), served alongside several breakfast sides (try the moon fries!) , or simply topped with any assortment of jams (over a dozen flavors are available) from the self serve bar. The best deal here is the Half Breakfast special, which includes a biscuit and 2 sides for just 6 bucks. Vegan or gluten-free? Don’t worry there is still a biscuit for you. Although the dairy-free/gluten free version isn’t quite as tasty, it’s decent enough, especially when topped with delicious flavored jam or honey. The line is often super long, so if crowds bother you, you may want to get here right at opening, or better yet, avoid weekends altogether. Fortunately, they usually have tasty coffee out while you wait! 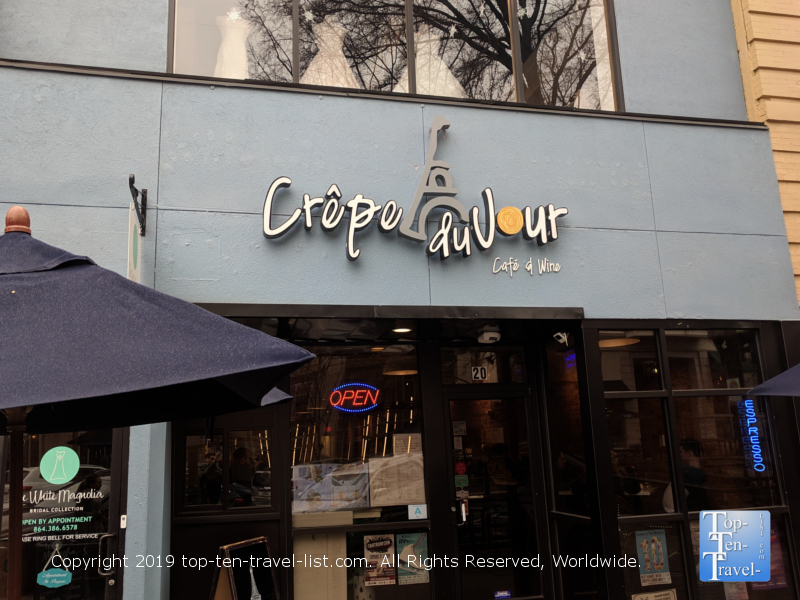 Crepe du Jour is a charming French cafe conveniently located in the center of Main Street. It’s easy to miss as it tends not to draw as much traffic as the more popular eateries. If you are looking for a laid-back dining experience, Crepe du Jour is a great choice. Over a dozen crepes, both savory and sweet comprise the menu. 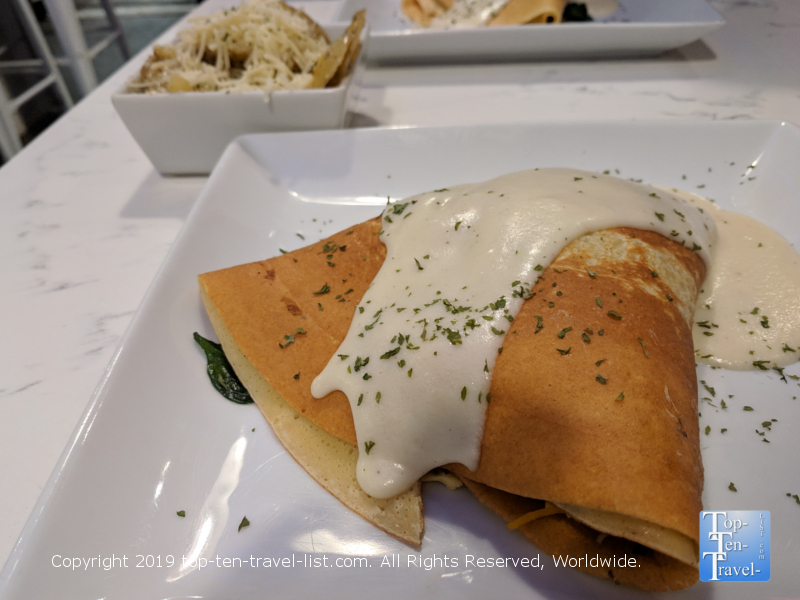 From a decadent nutella filled crepe, drizzled with chocolate and topped with berries and whipped cream, to a savory mushroom, spinach, and cheese crepe, there is an option for every taste bud. For an extra buck, you can make your crepe gluten-free. Try a side of delicious Truffle Au Gratin potatoes or cap off your meal with a delicious creme brulee crepe. 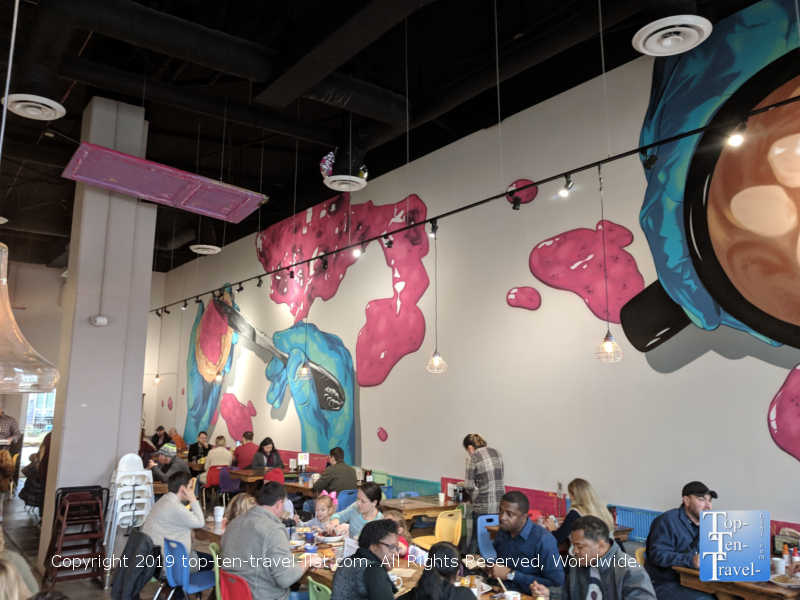 Asides from great fare, Crepe du Jour serves excellent coffee from Counter Culture, a specialty single origin roaster which started in Durham, NC. If you arrive early enough in the morning, you can usually score one of the coveted window seats. If it’s nice outside, they have a lovely patio surrounded by shady trees. 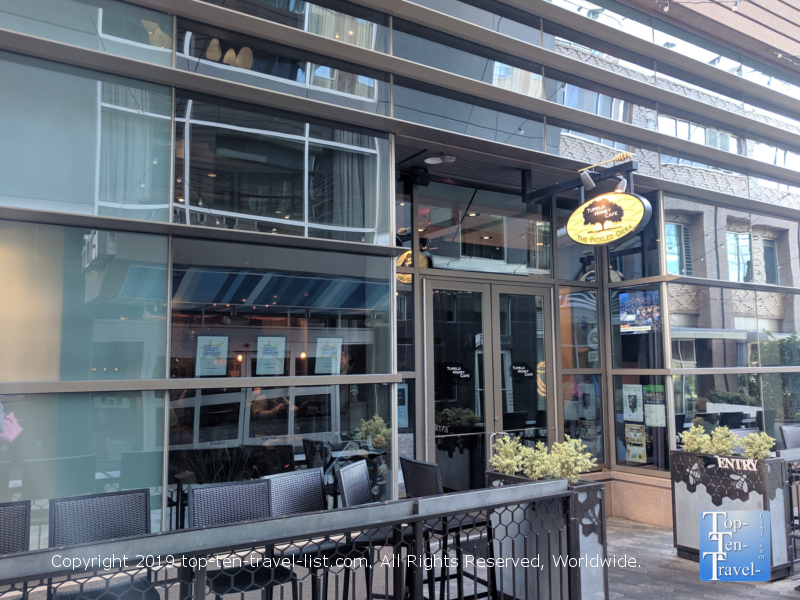 A delicious crepe, unlimited coffee, and people watching along Main Street definitely places Crepe du Jour amongst the must-try breakfast experiences downtown. 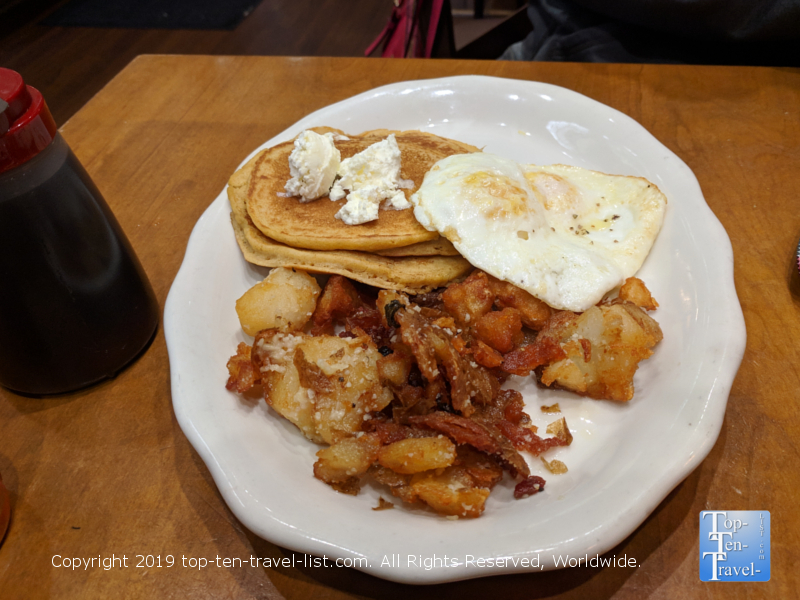 Tupelo Honey is a popular southern chain which started in Asheville and has since spread to include many locations across the Southeast. 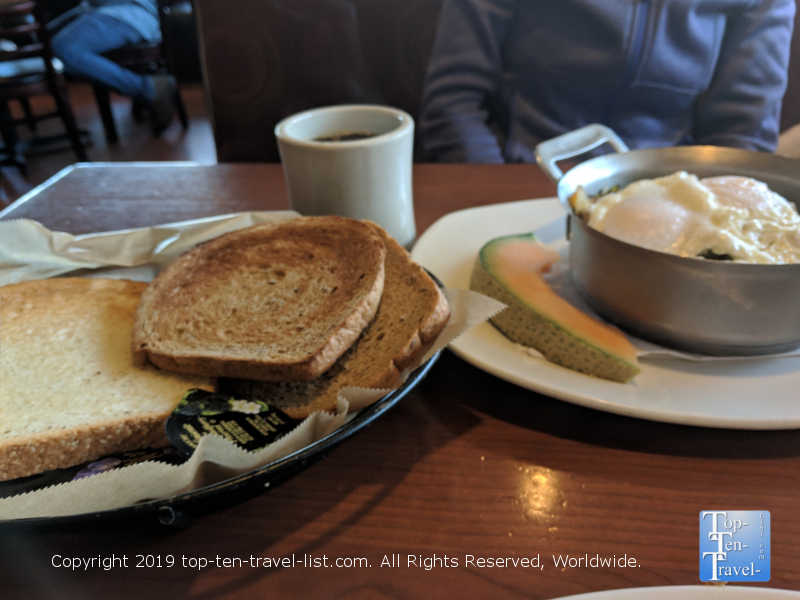 As downtown Greenville lacks an abundance of quality sit down breakfast restaurants, Tupelo is very popular with the weekend brunch crowd. And, for good reason. Everything is made from scratch here with a focus on local ingredients. 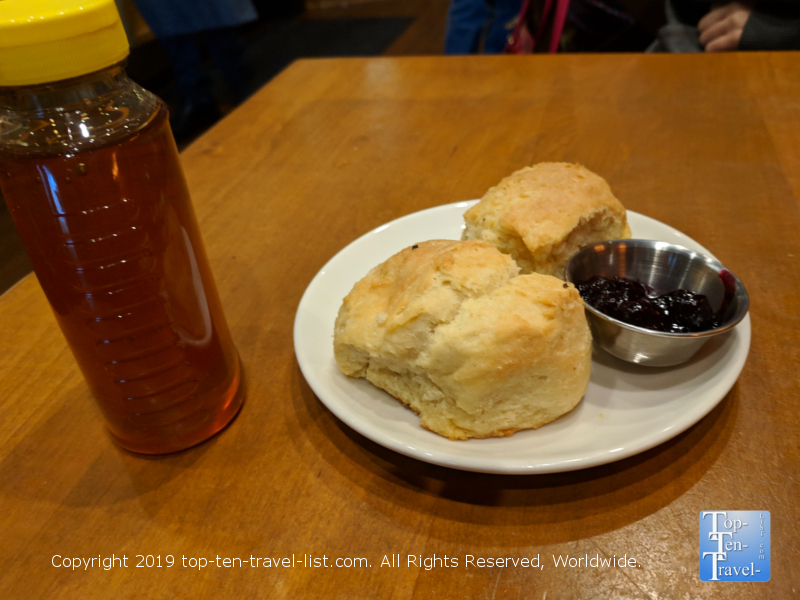 The scratch made biscuits here, which are brought out pipping hot alongside honey as soon as you sit down, are really the main reason to visit Tupelo. 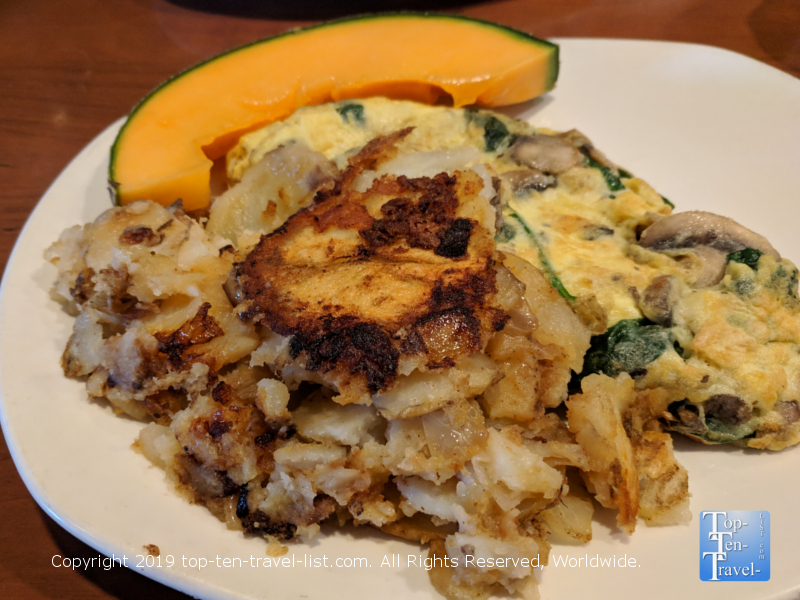 Here you have the choice of going with a traditional classic, or trying out a Southern specialty like Sweet Potato pancakes, Shrimp and Grits, or Pecan Pie French Toast. 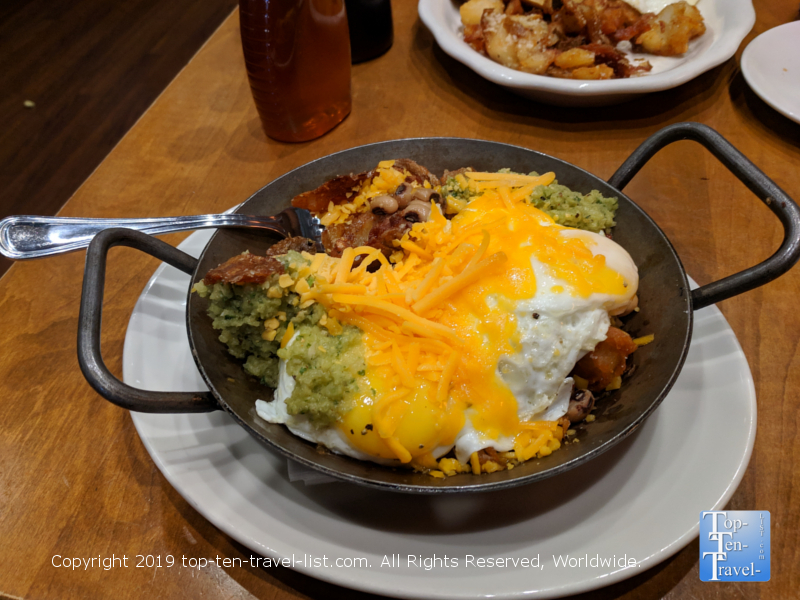 The Old Skool Breakfast Bowl (eggs, potatoes, black eyed peas, salsa verde, cheddar cheese, and goat cheese grits), is the way to go if you are looking to keep it simple, yet still flavorful. The best option here by far is the create-your-own breakfast combo (3 for $10 or $4 for 12). Nine different options are available, so you can mix and match based on your particular craving that day. The Sweet Potato pancakes are definitely worthy of the caloric splurge.